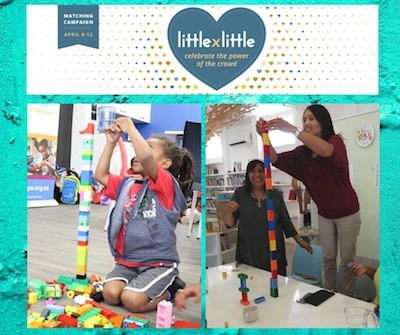 Children's Helpers Worldwide | Supporting Education and Training in Cape Town, Little by Little! We are excited to share with you that GlobalGiving will be running its Little by Little campaign from 8 to 12 April! This is a chance to support ORT SA CAPE’s programmes for children and teachers in disadvantaged communities around Cape Town. Your donations will support science and robotics workshops for children, as well as training sessions for teachers. Over the next few months, ORT SA CAPE will be holding teacher training sessions in Saldanha Bay, near Cape Town, with a focus on developing children’s perceptual skills. The campaign will start at 2pm UK time (3pm in South Africa) on Monday 8 April. During that week, your help will go extra far! Donations of up to 50 USD (around £38) will be matched by 60%, whilst matching funds last. In addition, there will be bonus prizes for the charities that raise the most, but to even be eligible, we will have to raise 1000 USD (around £756) from at least 10 people. If you are able to help with sharing our project page, during the campaign, that would be wonderful! To find out more about ORT SA CAPE’s work, you can see our updates on how your contributions have previously been used here. You can also see a video of some children from Rooikappie Pre-School Centre enjoying a visit to the Cape Town Science Centre, during one of ORT SA CAPE’s workshops, here. 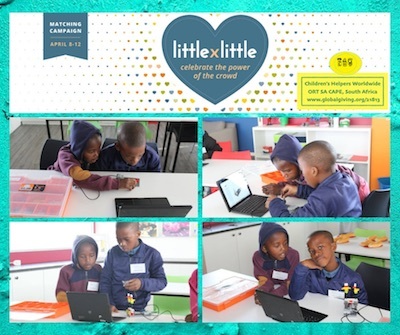 Any help with sharing our project page during the campaign, will be so much appreciated and will help to make a difference for children and teachers in Cape Town.